You are represented on the board by your character, who has been sent on a mission to make your faction's claim to the uncharted lands surrounding the defunct Factory. Each character unit is comprised of a person and their animal companion. 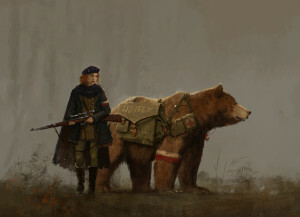 An expert marksman and a helpful bear, Anna and Wojtek traveled across the countryside during the Great War, becoming living legends as they distinguished themselves in battle and showed compassion to even the poorest farmers. 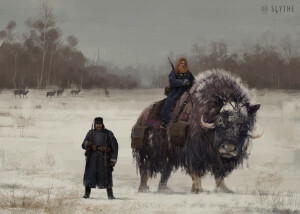 With the Factory shut down and rumors swirling about a growing Rusviet force, Anna and Wojtek have accepted a mission to ensure the unity and independence of Polania by securing the eastern border and patrolling the lands surrounding the Factory. 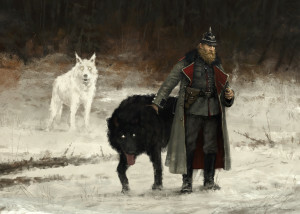 During the war, Gunter and his wolves led elite mech squads across the forests and mountains of Saxony and Europa. His name was both feared and respected, and his jacket grew heavy with medals of honor. 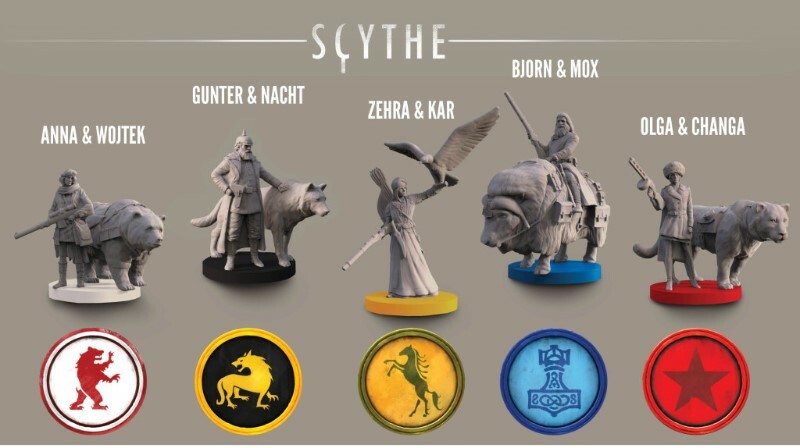 Now that the war is over, the Emperor has asked Gunter to embark on a new adventure to the east, where he sees a fresh opportunity to expand the Saxony foothold on the unclaimed lands surrounding the Factory. Tag is shown on several encounter cards, but she is not part of the character miniature. 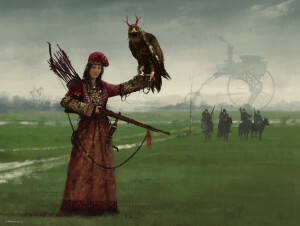 The firstborn daughter of the Khan of the Crimean Tartars, Zehra is able to see through her eagle's eyes, heightening her already formidable skill with the bow. Though her father was loath to adopt the Factory's advances, he realized that the world was changing and he could not leave the Khanate exposed to its rivals. Reluctantly, he has tasked his daughter with an expedition to the north for the purpose of acquiring more modern technology and ensuring lasting peace for their people. When Olga's first love, Viktor, went missing during the Great War, she vowed to find him again. 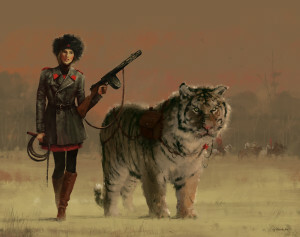 She joined the Rusviet military intelligence service with Changa, her Siberian tiger, at her side. With her intelligence and ambition, she has risen quickly through the ranks, and has used her newly-earned authority to launch a full-blown invasion into the western lands-a desperate attempt to find her beloved Viktor, with the full strength of the Rusviet military at her back! Bjorn, the descendant of a renowned Viking family, was saved from perishing in a blizzard by a kindly muskox. After surviving the ordeal, Bjorn took the creature as his mount and named him Mox. Together they embarked on a series of adventures across the land, serving as ambassadors to other tribes, executing military operations, and seeking out new oil reserves. The King has now sent them southward to add new villages and farms to the kingdom, either by diplomacy or by force, as well as to explore the Factory with the hope of gaining a technological advantage for future wars.